Set on a headland between Magaluf and Palmanov and just 150 metres from the beach, the TRH Palma Nova gets the thumbs up for its location. This young and lively 3 star hotel is the perfect place to unwind poolside by day and then hit the town when the sun goes down. When it comes to swimming and sunbathing, you have got the choice of a freeform pool outdoors and another heated one indoors. If you want to up the tempo, challenge your partner to a game of tennis or pump it up in the gymnasium. For the ultimate in relaxation, head to the chillout area, pop into the Jacuzzi or kick back in the sauna. When it comes to food and drink, the restaurant serves up a tasty array of buffet style dishes. Snacks, cool beers and fruity cocktails are on the menu in the poolside snack bar and cafe bar. Pool parties with guest DJs keep the fun going by the pool late into the evening. Back at your accommodation; expect lots of space, comfy beds, a kitchenette and your own private balcony. 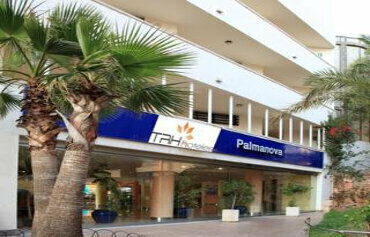 Discover why the TRH Palmanova Apartments are a popular place to stay in Palma Nova. 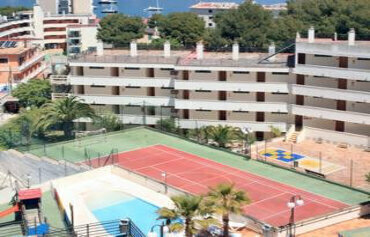 The TRH Palmanova Apartments has all the facilities you would expect from 3 star apartments in Majorca. Highlights include: An outdoor swimming pool, Jacuzzi, kids pool, large solarium with deckchairs, bar service and live DJs poolside, an indoor pool, cafe bar, tennis court, sauna, gym, chill out area and restaurant. The 24 hour reception offers a concierge, internet access, laundry service, luggage room, medical assistance and taxi service. 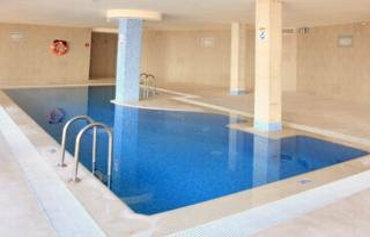 The TRH Palmanova Apartments has 211 modern and well equipped guest apartments. All apartments have balcony or terrace, kitchen with microwave and fridge, air conditioning, piped music, satellite television and bathroom. There are plenty of options to tempt your taste buds at the TRH Palmanova Apartments. The main restaurant serves up a great selection of buffet style meals, with dishes from around the world. Snacks and drinks are on the menu in the poolside snack bar. Everything from your morning coffee, evening cocktails and nightcaps are served in the cafe bar. Pool parties are a regular feature of the nighttime entertainment. 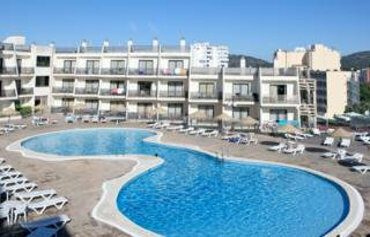 The apartments are located in Palmanova, 150m from Magaluf beach and a 10 minute walk from bars and clubs such as BCM. Aqualand Water Park is 1.7kms from the complex and Palma Airport 28kms away.